Tag: Does some dark matter carry an electric charge? Does Some Dark Matter Carry An Electric Charge? Astronomers have proposed a new model for the invisible material that makes up most of the matter in the Universe. They have studied whether a fraction of dark matter particles may have a tiny electrical charge. Munoz and his collaborator, Avi Loeb of the Harvard-Smithsonian Center for Astrophysics (CfA) in Cambridge, Mass., explore the possibility that these charged dark matter particles interact with normal matter by the electromagnetic force. Their new work dovetails with a recently announced result from the Experiment to Detect the Global EoR (Epoch of Reionization) Signature (EDGES) collaboration. In February, scientists from this project said they had detected the radio signature from the first generation of stars, and possible evidence for interaction between dark matter and normal matter. Some astronomers quickly challenged the EDGES claim. Meanwhile, Munoz and Loeb were already looking at the theoretical basis underlying it. The story begins with the first stars, which emitted ultraviolet (UV) light. According to the commonly accepted scenario, this UV light interacted with cold hydrogen atoms in gas lying between the stars and enabled them to absorb the cosmic microwave background (CMB) radiation, the leftover radiation from the Big Bang. This absorption should have led to a drop in intensity of the CMB during this period, which occurs less than 200 million years after the Big Bang. The EDGES team claimed to detect evidence for this absorption of CMB light, though this has yet to be independently verified by other scientists. However, the temperature of the hydrogen gas in the EDGES data is about half of the expected value. 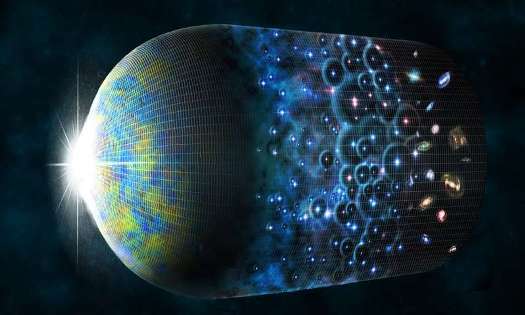 At the time when CMB radiation is being absorbed, the any free electrons or protons associated with ordinary matter would have been moving at their slowest possible speeds (since later on they were heated by X-rays from the first black holes). Scattering of charged particles is most effective at low speeds. Therefore, any interactions between normal matter and dark matter during this time would have been the strongest if some of the dark matter particles are charged. This interaction would cause the hydrogen gas to cool because the dark matter is cold, potentially leaving an observational signature like that claimed by the EDGES project. Only small amounts of dark matter with weak electrical charge can both explain the EDGES data and avoid disagreement with other observations. If most of the dark matter is charged, then these particles would have been deflected away from regions close to the disk of our own Galaxy, and prevented from reentering. This conflicts with observations showing that large amounts of dark matter are located close to the disk of the Milky Way. Scientists know from observations of the CMB that protons and electrons combined in the early Universe to form neutral atoms. Only a small fraction of these charged particles, about one in a few thousand, remained free. Munoz and Loeb are considering the possibility that dark matter may have acted in a similar way. The data from EDGES, and similar experiments, might be the only way to detect the few remaining charged particles, as most of the dark matter would be neutral. “The viable parameter space for this scenario is quite constrained, but if confirmed by future observations, of course we would be learning something fundamental about the nature of dark matter, one of the biggest puzzles that we have in physics today,” said Harvard’s Cora Dvorkin who was not involved with the new study. Lincoln Greenhill also from the CfA is currently testing the observational claim by the EDGES team. He leads the Large Aperture Experiment to Detect the Dark Ages (LEDA) project, which uses the Long Wavelength Array in Owen’s Valley California and Socorro, New Mexico. A paper describing these results appear in the May 31, 2018 issue of the journal Nature. Author Mitch BattrosPosted on May 30, 2018 Categories Astronomy, Dark Matter and Dark EnergyTags Does some dark matter carry an electric charge?